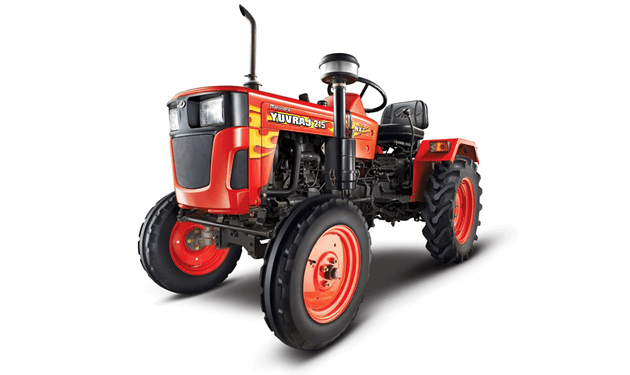 Mahindra Yuvraj 215 NXT is a 15HP compact tractor with solid style and solid performance. Ease of operation and fuel efficiency makes the Yuvraj 215NXT the ideal tractor for small landholdings and inter-culture operations. Mahindra Yuvraj 215 NXT has been specially designed for crops like soybean, cotton, Maze, sugarcane and orchards like Grapes, Mango, oranges, and more. Its unique compact design and adjustable rear track width makes it ideal for operating in between two crop rows as well as in orchards for a variety of inter culture applications. It is used by farmers extensively for multiple applications like rotavation, cultivation, sowing, threshing, spraying operations as well as haulage operations. Fits in the tightest of fields especially designed to perform between two crops (inter-crop). Less space in-between two tyres and can be further reduced by adjusting the tires. Provides precision hydraulics even in the 15 hp tractor. Ensures automatic and uniform depth throughout the field with any manual intervention. Enhances comfort while driving with its ergonomically designed side shift gears. It also adds additional space for easy entry and exit. Crucial feature in orchard operation. It is a two part detachable silencer for ease of working in orchards as well as in turning from one row to another. Seat with weight adjustment provides extra comfort in long drive. India 1st 15 hp water cooled engine. Delivers superior performance and best in class fuel efficiency. Tool box below battery box for easy and immediate access.